A new home is a wonderful thing. So while you were a fan of the rare and upscale threads at the Webster Temporary, you always felt that the small, ad hoc space on Collins didn't do the merch justice. Get excited: after over a year of construction (and more than a few delays), we bring you word on the permanent home of The Webster Miami, a new den of men's fashion (and women's fashion), opening today. 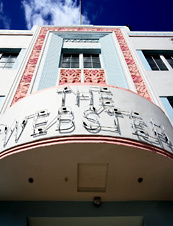 Housed in a 1930s deco hotel, the Webster feels like a private residence decorated by some of the world's most cutting-edge fashion mavens (which it sort of is). The three owners have all worked for big-name couture houses (Balenciaga, Jil Sander) and are able to score exclusive lines like Trussardi (think English cowboy meets deep V-necks) and Billionaire Boys Club (a rad mind-meld between Pharrell Williams and Japanese streetwear designer Nigo). It ain't small either: three full floors of luxury goods (including vintage watches and jewelry), all chosen by design geniuses who know what will catch the eye of that comely patron at the next Art Basel party. A downstairs restaurant, Caviar Kaspia, will also be opening soon, offering you the chance for post-shopping Sevruga and champagne. You know: just good, simple food.